A la carte sandwiches, salads, sides, sweets from our 2 amazing restaurant menus; the catering that started it all. Check our our rotating seasonal hot buffet option as well; menus include your choice of 3 salads, 3 sides, and 3 proteins from $12-20/person depending on your package. 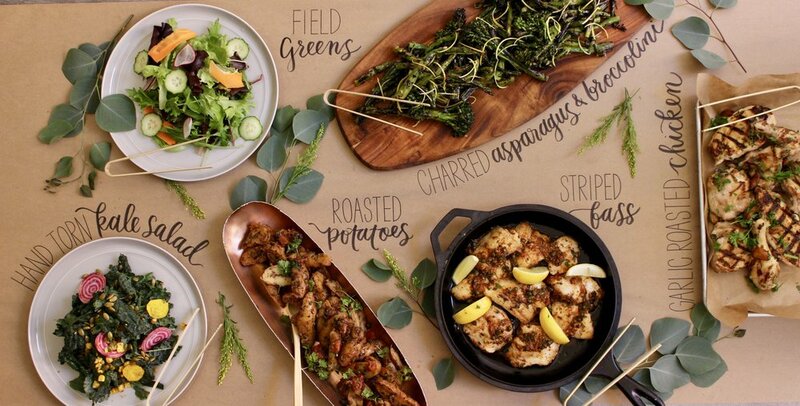 Simple, delicious, affordable drop-off catering from our full-service events kitchen. Our famous breakfast burritos, full spreads (scrambled eggs, bacon, & potatoes), and simple continental breakfast (fresh fruit, greek yogurt parfait bar with all the fixins, pastries). We have breakfast packages for all of your early morning office needs. We cater way more cheese & mezze than we’d like to admit! Our clients love our cheese & mezze platters. Our team can drop-off directly to your door in our compostable boxes ready for your next casual gathering or office happy hour. We also have plenty of cold, ready to eat appetizer platters to choose from.